C-COM Satellite Systems: auto-deploy antennas in Japan. Ottawa, August 2014: C-COM Satellite Systems Inc., a leading global provider of mobile auto-deploying satellite antenna systems, has announced that a number of its iNetVu® systems have recently been deployed in the western part of Japan to assist with emergency communications in an area hit by massive landslides. 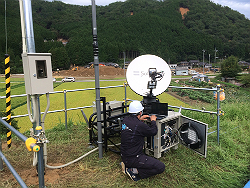 Japan Satellite Communications (JSC), C-COM’s largest reseller partner in Japan, and their customer, the third largest telecom operator in the country, have deployed a number of iNetVu® mobile antennas in the affected regions to re-establish cellular communications and provide emergency services. “We have been deploying the C-COM manufactured iNetVu® mobile antennas for more than 3 years.” said Mr. Yoshiya Kato, Chief Technology Officer & Board Member of Japan Satellite Communications. “JSC has deployed over 350 iNetVu® mobile antennas across Japan. Most of these antennas are used for cellular backhaul and emergency services. The C-COM antennas have also been deployed during the 2011 Great East Japan Earthquake/Tsunami and were the first to be deployed for cellular emergency communications to a large number of the population located in the tsunami affected areas. Our customers in Japan depend on the reliability of the iNetVu® products which have performed flawlessly during emergencies such as these.” added Mr. Kato. “Our unique satellite antenna technology makes it possible to replace downed cell towers in a matter of minutes” said Leslie Klein President and CEO of C-COM Satellite Systems Inc. “It is gratifying to be able to provide our resellers and their customers a product that, with the simple press of a button, can restore cellular communications and deliver lifesaving services to a disaster zone such as this one in Japan” added Klein.